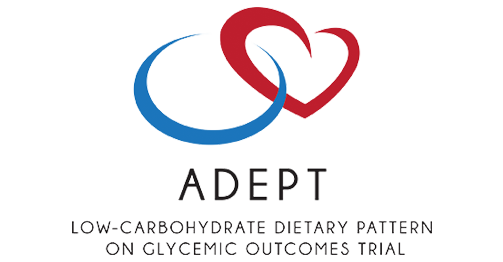 Project Summary: The objective of this randomized clinical trial is to examine the effects of a behavioral dietary intervention that promotes a low-carbohydrate diet compared with usual diet in individuals with or at high risk of type 2 diabetes. The primary outcome will be difference in change in a marker of blood sugar in the intervention group compared with the usual diet group over a 6-month period. Secondary outcomes will include other measures of glycemic control and other cardiometabolic risk factors. Project Summary: Proteinuria is an early and sensitive marker of kidney damage. It is also a risk factor for chronic kidney disease (CKD) progression, cardiovascular disease, and death. In previous small clinical trials of short duration, reducing dietary sodium intake was associated with a reduction in proteinuria; however, the association between dietary sodium reduction and proteinuria has not been tested in any large randomized trials. Thus, the aims of this trial are to study the effect of dietary sodium reduction on albuminuria in patients with CKD and determine whether the effect of sodium reduction on albuminuria is different based on race (as there is almost no data on the effects of dietary sodium reduction on CKD in African-American patients). Project Summary: Sarcopenia, the age-associated decrease of skeletal muscle mass and muscle strength, is increasingly recognized as a serious public health problem. Individuals with sarcopenia exhibit impaired balance, increased prevalence of falls, elevated sense of frailty, and reduced independence. The importance of gut microbiota for muscle metabolism has been implicated in animals. However, no study has directly and specifically assessed the significance of gut microbiota for risk to sarcopenia in humans. Hence, this highly innovative metagenome-wide association study (MWAS) on gut microbiota will test whether alterations in the composition and/or activity of the human gut microbiota might be associated with sarcopenia risk; aims to identify gut metagenomic markers significantly associated with sarcopenia risk in humans; and assess potential mechanisms underlying the observed gut microbiome-osteoporosis risk association. Project Summary: The overall goal of this project is to characterize the cardiometabolic lifecourse of women who experience early age at menarche throughout adolescence and adulthood by integrating omics data into large-scale epidemiologic studies. The study will build upon resources from three prospective cohorts including the Nurses’ Health Study (NHS), NHS II, and Growing Up Today Study to characterize body weight change patterns in young adulthood and risk for CVD in women. This research is anticipated to characterize body weight change patterns during early adulthood among women according to age at menarche and to determine potential pathways that may subsequently lead to a higher risk for CVD.